You are here: Home / Amazing Tips / Is Nutmeg Good for You? Is Nutmeg Good for You? The nutmeg fruit is native to the tropical regions of the world, the part actually used is the seed which is what we call ‘nutmeg’. The seed is used to extract an essential oil and at the same time, it is dried and grinded to be used as a spice. It has a typical strong but delightful smell; the taste is just as strong, maybe a bit bitter. It gives a warmish aroma, though. It is a popular spice often used with milk in drinks as well as added to vegetable soups and cream sauces; sometimes it is also used to add that extra touch of flavor to cakes, pastries and pies. The nutmeg spice and its essential oil however, are not limited for culinary purposes alone, but offer a wide range of health benefits too. In ancient times nutmeg was often used for medicinal purposes in Asian and Middle Eastern countries. Before going into details about its uses and benefits, it is very important to note that an overdose of nutmeg can be damaging, the reason being that it contains a hallucinogen, a component that causes hallucinations and delusions. The recommended safe daily dosage is up to two tablespoons in adults. Any more than that and it may cause nutmeg toxicity. As a precaution, it should, at all times, be kept out of reach of children and animals. Many problems of the digestive tract like bloating, constipation, flatulence, indigestion and diarrhea can be cured by the use of nutmeg, either the powder or the oil. It is known to stimulate digestion and fight digestive tract infections, along with helping in relieving excess gas from the intestines. Drops of the oil mixed with honey can provide relief from the above mentioned ailments. Bad breath is caused by a buildup of bacteria in the mouth; nutmeg helps with this problem by fighting the bacteria as it contains anti-bacterial properties. This is probably why nutmeg is found in many toothpaste brands. The anti-inflammatory properties of nutmeg help in relieving pain. For instance, for rheumatism nutmeg oil is often applied to the affected area, sometimes mixed with almond oil. It is also known to possess sedative-like attributes. Thus, it helps soothe sore muscles. For toothaches, a cotton swab dipped in nutmeg oil can be applied around the aching tooth. Pollution, stress, diet, use of tobacco, alcohol, medication and other factors internally and externally lead to a buildup of toxics in our body. Detoxification is essential for good health; it helps rid the kidney and liver of those toxins as these two organs are most affected. Use of nutmeg on a daily basis aids in this cleansing process. 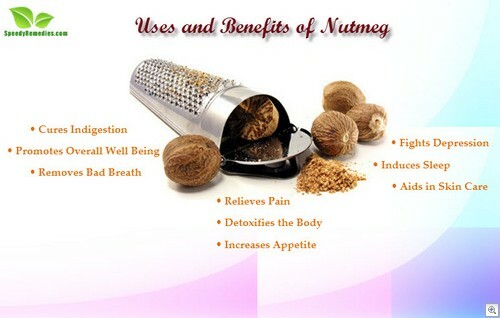 As nutmeg can help get rid of flatulence and excessive gas it can, in the process, help in increasing appetite. Incorporating it into the daily diet will prove beneficial for those who suffer from a loss of appetite due to digestive tract ailments. A warm cup of milk with around 1/4th teaspoon of nutmeg powder when drunk at night, before sleep, is said to wondrously induce a relaxed and deep sleep. It helps calm the muscles and facilitates a soothing effect. Nutmeg, being a relaxant agent, fights depression and anxiety, in ancient Arab and China it was used as a remedy for these ailments, among others. Two of the components of this spice viz. ; myristicin and elimicin have soothing as well as stimulating effects on the brain. It can, thus, improve concentration too. Using nutmeg regularly with your skin care regimen can be a remedy for a host of problems like acne, blackheads, dark spots and to get rid of dead skin cells. For healing eliminating acne marks, a paste of nutmeg powder and honey can be applied to the marks. This can visibly reduce the scars. Nutmeg powder mixed with orange lentil powder can be used as a scrub to get rid of blackheads and dead skin. Furthermore, you can grind nutmeg with water to make a paste and apply on spots. Leave for 15-20 minutes; it should help lighten the spots, giving way to a clearer, smoother skin. Nutmeg, when consumed in moderation, should prove beneficial, the same as it is said that ‘too much of anything is bad’. At the same time like with everything else, if trying out nutmeg for the first time, do so early in the day so that any adverse reactions to the substance can be dealt with during the day.